Cool image time! The Lunar Reconnaissance Orbiter (LRO) science team today released a beautiful oblique image looking of the central peaks of Compton Crater, a far side crater with a floor that is fractured and is one of about 200 hundred such craters. Today’s Featured Image highlights an floor-fractured crater (FFC) that could tell us much about the lunar crust. An asteroid or comet impact is thought to have excavated 146.6-kilometer-wide Compton crater about 3.85 billion years ago. Igneous intrusion or viscous relaxation — or perhaps both processes — subsequently produced branching fractures and small basalt plains within Compton crater. The latter are darker than their surroundings. Unlike Copernicus Crater, the surface appears smooth. Go to the link and zoom in to see what I mean. All the fractures appear very large and filled in. Of course, that could be because of the image’s resolution, and that other images might show more details and pits. I find the central peaks more intriguing, however. It appears that, following their formation they were hit by several bolides, one of which carved a gigantic deep hole into those peaks. LRO passes over any given place on the Moon at least once every month (in the daylight), allowing the westward progress of the Yutu-2 rover to be seen. At the end of February, Yutu-2 was 69 meters from it’s home base, the Chang’e 4 lander; LROC images show Yutu-2 made 46 meters of westward progress during the month of February. It appears from these orbital images that they are taking the smoothest route, with the fewest obstacles, away from the lander. 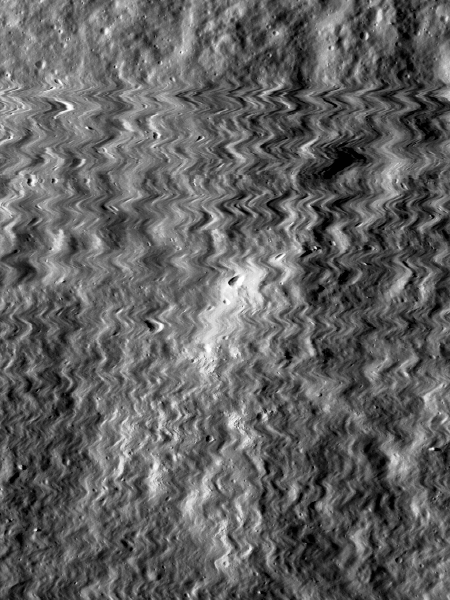 An analysis of data from one of Lunar Reconnaissance Orbiter’s (LRO) instruments have allowed scientists to map the movements of the scarce water on the lunar surface. Up until the last decade or so, scientists thought the Moon was arid, with any water existing mainly as pockets of ice in permanently shaded craters near the poles. More recently, scientists have identified surface water in sparse populations of molecules bound to the lunar soil, or regolith. The amount and locations vary based on the time of day. This water is more common at higher latitudes and tends to hop around as the surface heats up. …Water molecules remain tightly bound to the regolith until surface temperatures peak near lunar noon. Then, molecules thermally desorb and can bounce to a nearby location that is cold enough for the molecule to stick or populate the Moon’s extremely tenuous atmosphere, or “exosphere”, until temperatures drop and the molecules return to the surface. The quantities we are talking about here are very tiny. This will not be the water that future settlers will depend on. Instead, it will be those pockets of ice in the permanently shaded craters. The Lunar Reconnaissance Orbiter (LRO) science team has released its third and best image of the Chinese Chang’e-4 lander and Yutu-2 rover. The image on the right is a full resolution cropped section, with the lander on the bottom and the rover above and to the left. Just after midnight (UTC) on 1 February 2019 LRO passed nearly overhead the Chang’e 4 landing site. From an altitude of 82 kilometers the LROC Narrow Angle Camera pixel scale was 0.85 meters (33 inches), allowing a sharper view of the lander and Yutu-2 rover. At the time the rover was 29 meters northwest of the lander, but the rover has likely moved since the image was acquired. This view has close to the smallest pixel size possible in the current LRO orbit. In the future however, LROC will continue to image the site as the lighting changes and the rover roves! These future LRO images will allow us to track Yutu-2 and get an idea of its research, even if the Chinese do not release any information. The Lunar Reconnaissance Orbiter (LRO) science team has now released a second and closer image of Chang’e-4’s location on the far side of the Moon, which now also shows the nearby rover Yutu-2. The two arrows in the image to the right, cropped to post here, show both. The rover is the dot on the right, with the lander to the left, both just beyond the arrow tips. Both are very small, with Yutu-2 for example only two pixels across. Still, with both you can see their shadows, equally small, to the left of both bright dots. With sunlight coming from the right, all the craters, which are recessed, have their shadows on the right. The spacecraft, sticking up from the surface, have shadows going to the the left. As Yutu-2 continues its travels, LRO will likely take more images, allowing us to track it even if the Chinese provide limited information. 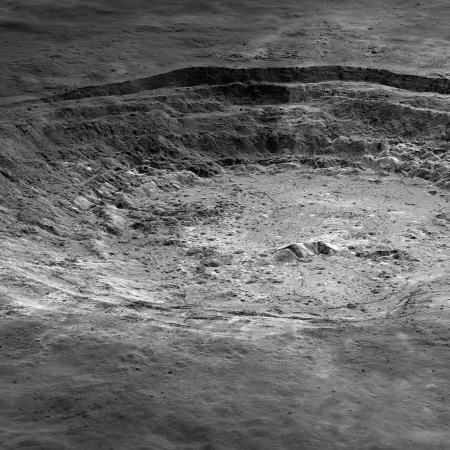 The Lunar Reconnaissance Orbiter (LRO) science team has released a spectacular oblique image that shows Chang’e-4 on the floor of Von Kármán crater. 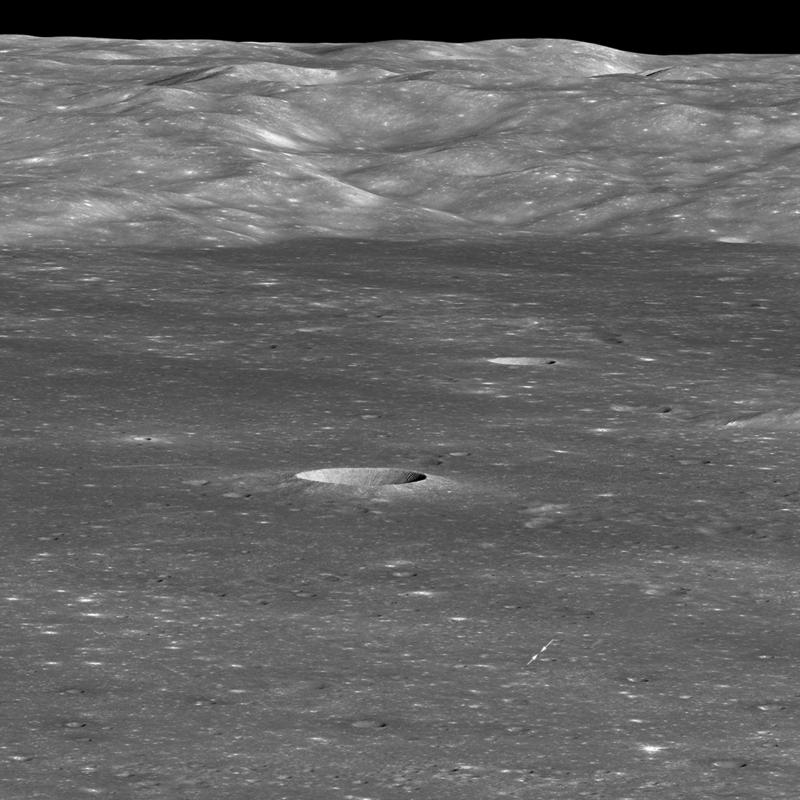 Four weeks later (30 January 2019), as LRO approached the crater from the east, it rolled 70° to the west to snap this spectacular view looking across the floor towards the west wall. 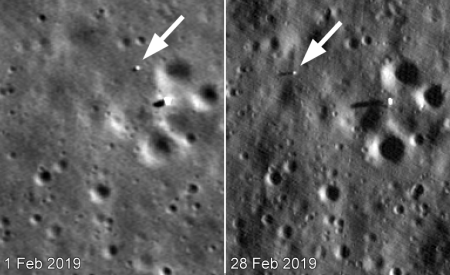 Because LRO was 330 kilometers (205 miles) to the east of the landing site, the Chang’e 4 lander is only about two pixels across (bright spot between the two arrows), and the small rover is not detectable. The massive mountain range in the background is the west wall of Von Kármán crater, rising more than 3000 meters (9850 feet) above the floor. The image on the right has been reduced to post here. If you click on it you can see a larger version, but you need to download a very large file at the above link to see it at full resolution. Cool image time! The Lunar Reconnaissance Orbiter (LRO) science team this week released a new high resolution image of the western rim of 63-mile-wide Plato Crater, located near the visible edge of the Moon’s near side. On the right is a slightly reduced version cropped to show the area of most interest. Plato crater is prominent, yet from our vantage point on Earth we never truly see it as it is. That’s because it is located far enough north of the lunar equator (center latitude 51.62°N, center longitude 350.62°E) on the curving surface of the spherical Moon that it appears foreshortened. Plato is round like most other impact craters, but from Earth we see it as an oval aligned east to west. A dark floor makes 101-kilometer-wide Plato crater stand out against a light-colored lunar highlands background. Plato crater is also prominent by association; the crater is located just north of 1145-kilometer-wide Mare Imbrium. A small part of this mare is visible at lower left in our Featured Image. Mare Imbrium is made up of many basalt layers laid down by violent volcanic episodes over a span of about 1.5 billion years. The basalts fill the Imbrium Basin, which a large asteroid or comet impact excavated about 3.85 billion years ago. When we look at a bright full Moon, round dark Mare Imbrium captures our gaze, then we see Plato crater, which is estimated to be about a hundred million years younger than the Imbrium Basin. That block is thus 14.5 miles wide, and almost a mile high. I am trying to imagine what it was like when it broke off the rim and fell eastward into the crater floor. I am having trouble doing so. Below is a image of the entire crater, with the area of the image above indicated by a white box. It shows clearly how this crater splashed into the basalt lava plain of Mare Imbrium. 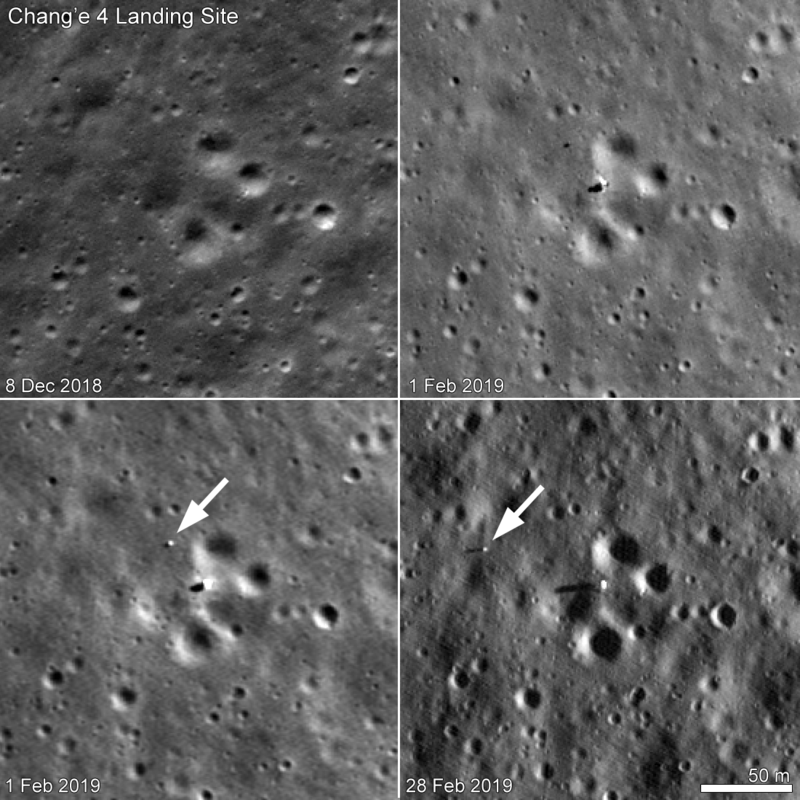 By referencing the footage released by China of Chang’e-4’s descent onto the Moon, the Lunar Reconnaissance Orbiter (LRO) team has been able to pinpoint exactly where the lander touched down. The image on the right has been reduced slightly. Click on it to see it in full resolution. The largest nearby crater to the lander is estimated to be about 80 feet across. Because the images were in December 2018 before the lander’s arrival, they do not show it. However, the LRO team now knows exactly where to look when they take new pictures in the next few weeks. Moreover, this will allow them to monitor Yutu-2’s travels as it roves the surface over the coming months. The Lunar Reconnaissance Orbiter (LRO) science team has released a high resolution image from 2010 pinpointing the area on the floor of Von Kármán crater where Chang’e-4 landed. On the right is a reduced and partly annotated version. They have not actually found the lander/rover, since this image was taken long ago before Chang’e-4 arrived. 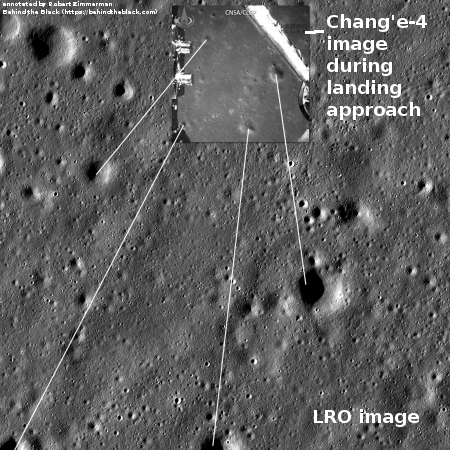 However, this image, combined with the Chang’e-4 landing approach image, tells us where the lander approximately landed. It also pinpoints where to look for it when LRO is next able to image this region, around the end of January. By then, Yutu-2 will hopefully have traveled some distance from Chang’e-4, and LRO will be able to spot both on the surface. Cool image time! The science team from Lunar Reconnaissance Orbiter (LRO) today released a new image, taken on November 3, 2018, of a relatively young small crater not easily seen from Earth. The unnamed crater, just 1.8 kilometers across, is too small to see from Earth with unaided eyes. It is in the Moon’s wild west, just past Oceanus Procellarum and close to the line dividing the nearside from the farside, so it would be hard to glimpse in any case. If you stood on the crater rim, you would see the Earth forever slowly bobbing up, down, and sideways close to the eastern horizon. The image above is a cropped and reduced-in-resolution section of the released image. If you click on it you can see this section at full resolution. The spectacular fractures that cut across the floor of Komarov crater [about 85 kilometers or 50 miles diameter] were formed when magma rose from the mantle, uplifting and fracturing the crater in the process. In this case the magma did not erupt to the surface, thus the fractures remain visible. An overview of Komarov Crater as well as other LRO images of it can be found here. The question that comes to my mind is the relative rarity of craters with such large fractures on their floors. I have noted this for Mars as well. It is expected that there is melt on the floor of all large impact craters. Why do a few produce such pronounced fractures, while most do not? This website posits one explanation, but its complexity leaves me unsatisfied. It also doesn’t explain why it happens only rarely. Cool image time! Lunar Reconnaissance Orbiter science team has released a new image of the central peaks of Copernicus Crater, shown on the right cropped and reduced in resolution. Copernicus (9.62°N, 339.92°E), which is easily seen with a moderately powerful backyard telescope, is one of the best-known craters on the Moon. Despite its age (around 860 million years), it is well preserved with over 4000 meters of relief from floor to rim, and the tallest of its central peaks rises approximately 1300 meters above the crater floor. 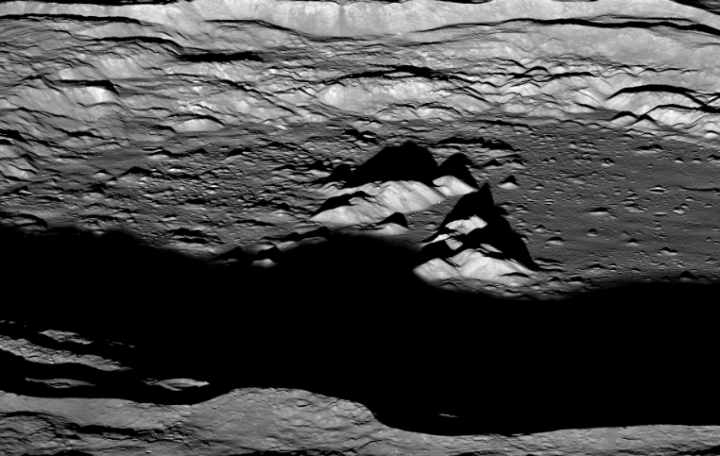 This image, centered on the central peaks, was captured just after dawn (86° incidence angle) as the Lunar Reconnaissance Orbiter slewed west to a 67°angle. The image is similar to one taken back in 2012, but has a higher resolution because it was shot from 50 miles elevation instead of 75. This crater was also the subject of one of the first breath-taking images ever taken of the Moon from lunar orbit, by Lunar Orbiter in November 1966. The wider view taken by LRO gives some context for the image above. The peaks shown in closeup here are part of the lower right grouping. If you go to the first link above you can zoom in and explore all parts of the full image, and see some quite amazing details, including the large boulders scatter throughout the hollows between the peaks. Cool image time! 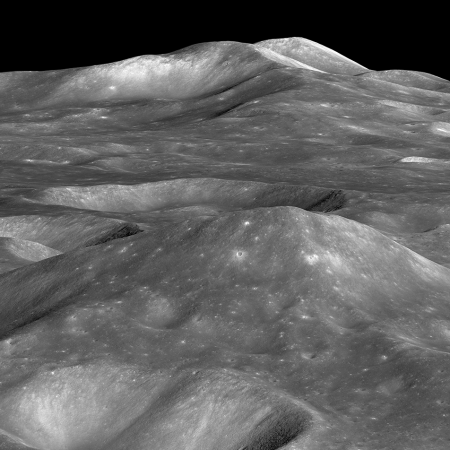 The image on the right, reduced slightly to post here, shows several high mountains on the far side of the Moon. If you click on the image you can see it at full resolution. The summit of the unnamed peak in the foreground (50.2° S, 236.6° E) has an elevation of 6710 meters, about 7000 meters (about 23,000 feet) of relief relative to the low point at the bottom of the image. The two peaks on the horizon, 200 kilometers in the distance (about 125 miles), have summit elevations of 4320 meters (14,200 feet) and 4680 meters (15,350), respectively and both rise more than 6000 meters (almost 20,000 feet) above their surroundings. In the Lunar Reconnaissance Orbiter (LRO) science team release in June, they noted that the high peak here is actually taller than Denali (Mount McKinley), the highest peak within the U.S. And it has no name. They also note that the peak is likely 4 billion years old, and has experienced extensive erosion in that time, meaning that it is also likely shorter than it once was. I don’t have anything to add, other than this would be an amazing place to put up a resort, with trails taking you to the top of the mountains. In the lighter gravity, the hike would actually be somewhat easy, even wearing a spacesuit. And you wouldn’t have to worry about a thinning atmosphere as you climbed higher, as you do on Earth. You’d be carrying it with you. Wallach crater (4.89°N, 32.27°E) formed within a thin layer of black basaltic lava flows that overlie much brighter anorthositic material. Think of a white cake with chocolate icing. When the asteroid (or comet) impacted this “iced cake”, ejecta from deeper portions (white cake, or rather brighter anorthosite) was thrown out onto the icing (darker basalt) resulting in intermediate tones where the two materials mixed. 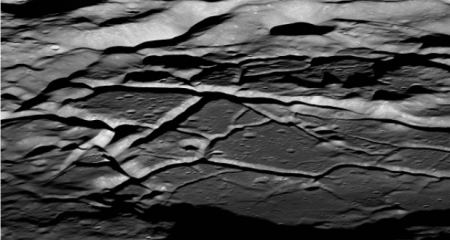 The dark streaks seen inside the crater are blocks of the icing (basalt) breaking off and creeping down slope. The fact that the deepest material lands on top of the shallowest material (known as inverted stratigraphy) was first described by Gene Shoemaker from his pioneering observations at Meteor Crater, Arizona. This effect simplifies sampling the local geology in three dimensions. As an astronaut traverses towards the rim of a crater, the rocks underfoot come from deeper and deeper within the crater. The rocks at the rim are from the deepest portions of the crater! It is especially interesting to use the viewer at the link to see the surrounding terrain, which includes two other craters that are far less distinct. Cool image time! The image on the right, reduced in resolution to post here, shows Aristarchus Crater, one of the more geological intriguing locations on the Moon. This oblique image was taken by Lunar Reconnaissance Orbiter (LRO), still operating in lunar orbit. If you click on the image you can see the full resolution image. Aristarchus crater is 40 kilometers (25 miles) in diameter and 2700 meters (1.7 miles) deep, with a central peak that rises 300 meters (almost a thousand feet) above the crater floor. When LRO pointed back towards the Sun, LROC was able to capture this magnificent view highlighting subtle differences in albedo (brightness). Some of the albedo contrast is due to maturity (young material is generally brighter than older material) and some reveal true differences in rock type. The central peak shows the complexity of what lies beneath the now hardened impact melt sea that filled the bottom of the crater. 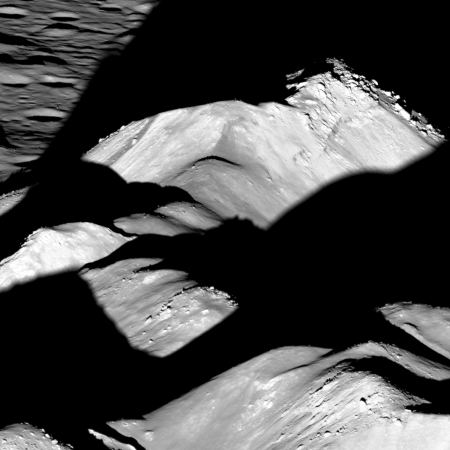 The best part however is the close-up they provided of the crater’s central peaks, posted below. A lava tube entrance near the Moon’s north pole? In reviewing Lunar Reconnaissance Orbiter data scientists think they have discovered several skylight entrances into a lava tube that is located near the Moon’s north pole. The new pits were identified on the northeastern floor of Philolaus Crater, a large, 43 mile (70 km)-diameter impact crater located at 72.1oN, 32.4oW, about 340 miles (550 km) from the North Pole of the Moon, on the lunar near side. The pits appear as small rimless depressions, typically 50 to 100 feet across (15 to 30 meters), with completely shadowed interiors. 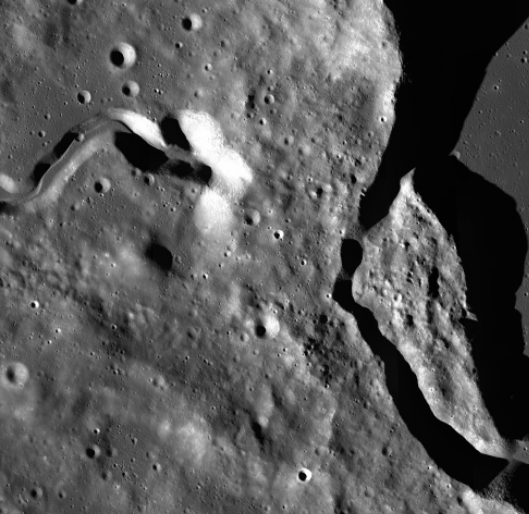 The pits are located along sections of winding channels, known on the Moon as “sinuous rilles,” that crisscross the floor of Philolaus Crater. 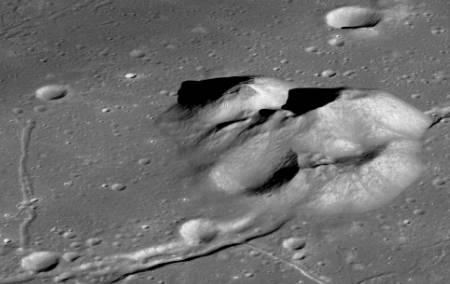 Lunar sinuous rilles are generally thought to be collapsed, or partially collapsed, lava tubes, underground tunnels that were once streams of flowing lava. 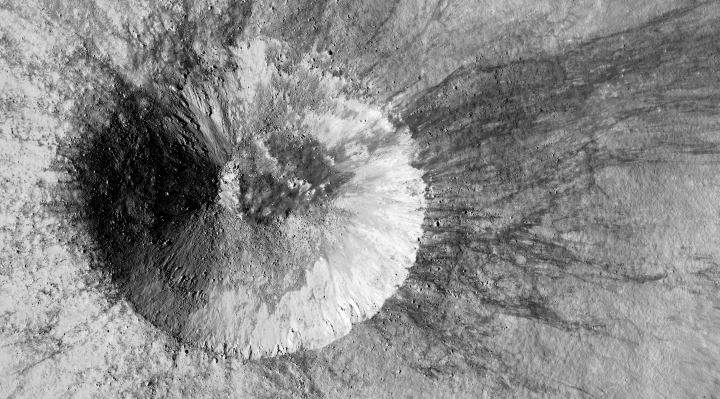 “The highest resolution images available for Philolaus Crater do not allow the pits to be identified as lava tube skylights with 100 percent certainty, but we are looking at good candidates considering simultaneously their size, shape, lighting conditions and geologic setting” says Pascal Lee, planetary scientist at the SETI Institute and the Mars Institute who made the new finding at NASA’s Ames Research Center in Silicon Valley. …Prior to this discovery, over 200 pits had been found on the Moon by other researchers, with many identified as likely skylights leading to underground lava tubes associated with similar sinuous rilles. However, today’s announcement represents the first published report of possible lava tube skylights in the Moon’s polar regions. The key here is that caves or lava tubes provide a good place to cheaply and quickly establish a lunar colony. While it is suspected that water might survive in permanently shadowed regions near the poles, up until now no one had found any good underground locations there. 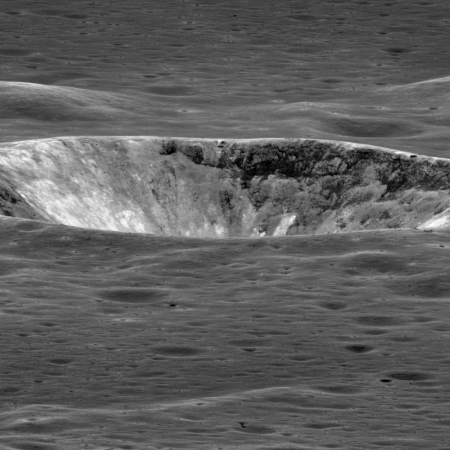 If this suspected skylight entrances prove true, this crater then becomes prime real estate on the Moon. 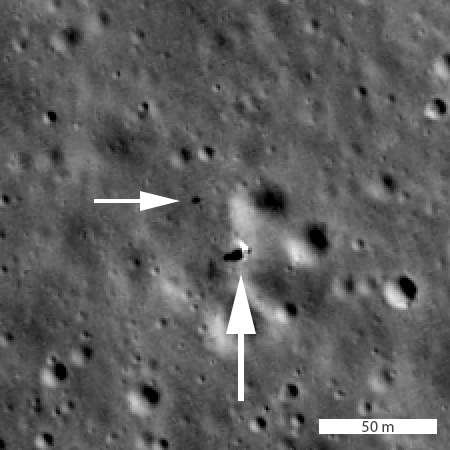 Eleven years after the European SMART-1 probe was sent crashing onto the Moon’s surface, scientists have finally identified in a Lunar Reconnaissance Orbiter image that crash site. 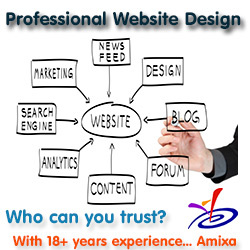 The image is shown on the right, reduced and cropped to post here. Stooke said: “Orbit tracking and the impact flash gave a good estimate of the impact location, and very close to that point was a very unusual small feature. It now seems that impacts of orbiting spacecraft, seen here from SMART-1, and also in the cases from GRAIL and LADEE, will form elongated craters, most of whose rather faint ejecta extends downrange”. A new analysis of Lunar Reconnaissance Orbiter data suggests that the coldest spots at the Moon’s south pole are also its brightest, even though they are generally in shadow, suggesting that the surface there might have a thin layer of water frost. These are also the areas where hydrogen has been detected, which strengthens the theory that this is water. The icy deposits appear to be patchy and thin, and it’s possible that they are mixed in with the surface layer of soil, dust and small rocks called the regolith. The researchers say they are not seeing expanses of ice similar to a frozen pond or skating rink. Instead, they are seeing signs of surface frost. Second, they have not detected this same pattern at the north pole, which strongly suggests that the permanently shadowed areas there do not even have frost. Overall, this result suggests that the Moon might have water on its surface, but not in great quantities. 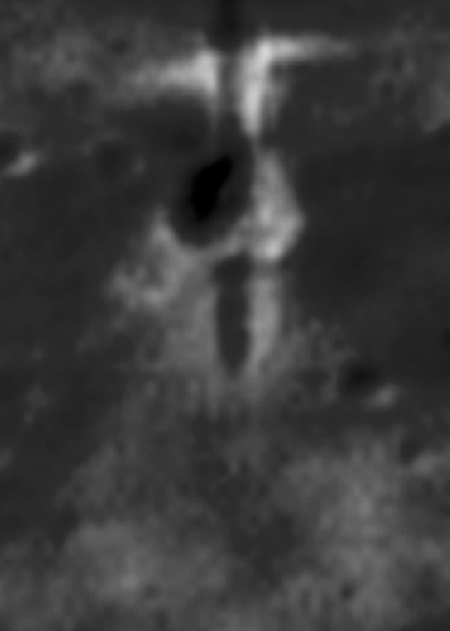 While taking an image in October 2014, Lunar Reconnaissance Orbiter had apparently been hit by some small object, causing it to vibrate and create the zig-zag distortions seen on the image, a cropped section of which is shown on the right. Clearly there was a brief violent movement of the left NAC [Narrow Angle Camera]. The only logical explanation is that the NAC was hit by a meteoroid! How big was the meteoroid, and where did it hit? The physical properties and vibration modes of the NAC are very well known – during development a detailed computer model was made to ensure the NAC would not fail during the vibrations caused by the launch, which are severe. The computer model was tested before launch by attaching the NAC to a vibration table that simulates launch. The model was solid, both NACs survived the test, and launch. Most of each NAC is sequestered inside the spacecraft structure, so only the leading edge of the baffle and the radiator are exposed to space, and thus are potential targets for impactors. From the detailed computer model, the LROC team ran simulations to see if we could reproduce the distortions seen the image. Assuming an impact velocity of 7 kilometers per second and a density 2.7 g/cm3, an impacting particle would have been 0.8 mm in diameter (~half the size of a pinhead). If the velocity was faster, then the particle would have been smaller, and if slower then larger. For comparison, the muzzle velocity of a bullet fired from a rifle is typically 0.5 to 1.0 kilometers per second. So the meteoroid was traveling much faster than a speeding bullet. In this case LROC did not dodge a speeding bullet, but rather survived a speeding bullet! The image is fascinating because you can see the vibrations slowly disappear as the zig-zags shrink and fade. 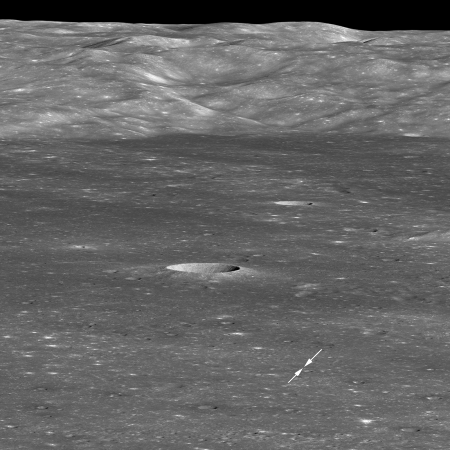 Lunar Reconnaissance Orbiter has located the impact site for the Apollo 16 rocket booster that, like four other boosters, had been deliberately crashed on the surface so the Apollo seismometers could use the vibrations to study the Moon’s interior. The other impact sites had been found already, but Apollo 16 was harder to pin down because contact with the booster had ended prematurely so its location was less well known. In a paper [pdf] presented this week at a lunar science conference, scientists announced the identification of more than 200 new impact craters on the Moon from Lunar Reconnaissance Orbiter (LRO). As of 1 May 2015, we have scanned and classified changes in 14,182 NAC temporal pairs using our automated change detection tool leading to the discovery over 200 impact craters ranging in size from 1.5 to 43 m. In addition, we also identified thousands of other surface changes, including about 44,000 low reflectance splotches, 3,500 high reflectance splotches, 850 mixed reflectance splotches, [and] 1 Chinese lander/rover. They think the splotches are created from impacts too small to see with LRO. The 2016 budget proposed by NASA shuts down continued operation of either the Mars rover Opportunity or Lunar Reconnaissance Orbiter. As the article notes, both these missions continue to provide us a great deal of scientific bang for the buck. To shut them down, only to spend far more later to replace them, seems incredibly stupid. 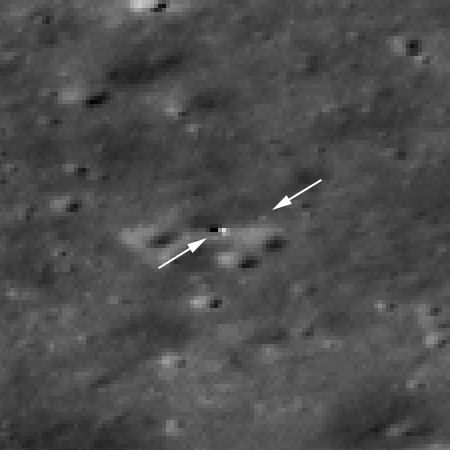 Lunar Reconnaissance Orbiter has spotted the impact crater formed when engineers sent the probe LADEE crashing into the lunar surface in April 2014. Compared with asteroid and meteoroid impacts on the moon, LADEE was actually traveling pretty slow, ‘only’ 3,800 miles per hour (1,700 meters per second). That combined with the relatively low mass and density of the spacecraft, a fairly neat crater of only 10 feet (3 meters) across was created. 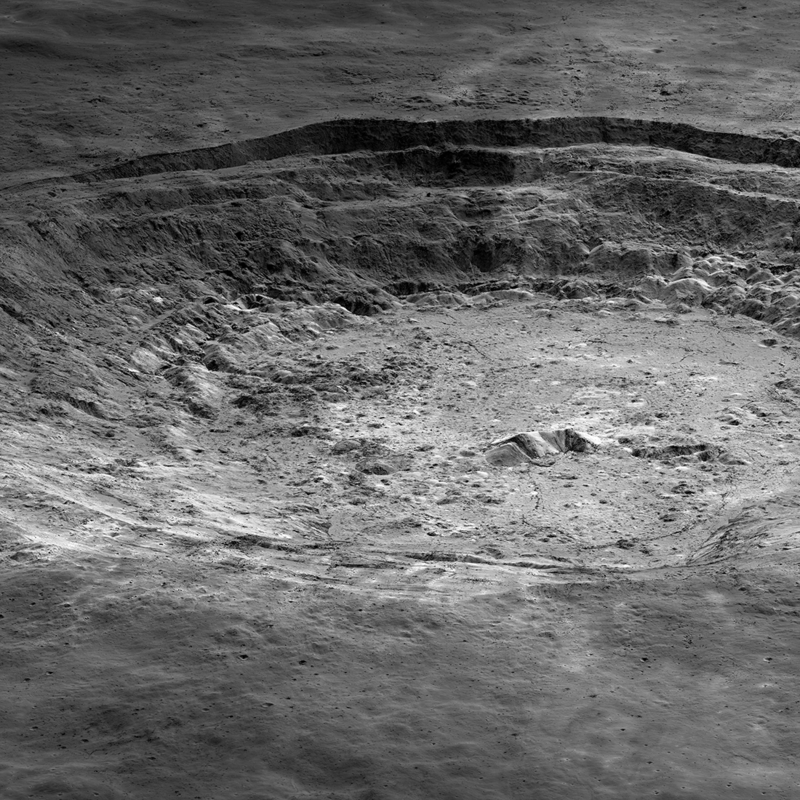 The crater barely registered in LROC’s image resolution, making it a very difficult task to identify the fresh man-made divot. New data from Lunar Reconnaissance Orbiter suggests that lunar volcanism petered out slowly and occurred more recently that previously believed. 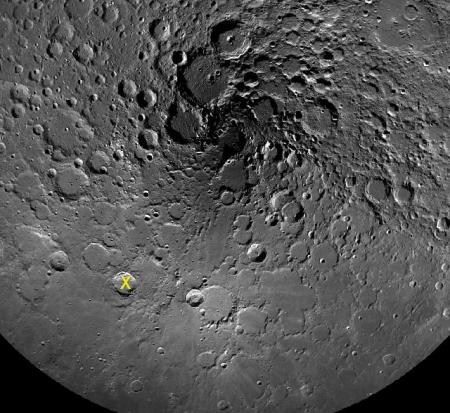 NASA’s Lunar Reconnaissance Orbiter (LRO) has provided researchers strong evidence the moon’s volcanic activity slowed gradually instead of stopping abruptly a billion years ago. Scores of distinctive rock deposits observed by LRO are estimated to be less than 100 million years old. This time period corresponds to Earth’s Cretaceous period, the heyday of dinosaurs. Some areas may be less than 50 million years old. Details of the study are published online in Sunday’s edition of Nature Geoscience. “This finding is the kind of science that is literally going to make geologists rewrite the textbooks about the moon,” said John Keller, LRO project scientist at NASA’s Goddard Space Flight Center in Greenbelt, Maryland. In a way, this new conclusion is an example of science discovering the obvious. It seems to me quite unlikely that volcanic activity on the Moon would have “stopped abruptly” under any conditions. That’s not how these things work. Lunar Reconnaissance Orbiter has confirmed the creation of a new crater on the Moon, the impact flash of which was spotted when it happened on September 11, 2013. The before and after images not only identify the new ~112 foot wide crater, they also show ejecta effects surrounding the crater. Budget issues continue to threaten a number of successfully functioning science spacecraft, including Opportunity on Mars and Lunar Reconnaissance Orbiter circling the Moon. Penny wise, pound foolish: Budget issues continue to threaten a number of successfully functioning science spacecraft, including Opportunity on Mars and Lunar Reconnaissance Orbiter circling the Moon. New geological research suggests that the hydrogen levels that have detected on the moon — which are used to predict the presence of water — might be a false positive and not exist at the levels predicted. The uncertainty of science: New geological research suggests that the hydrogen levels that have been detected on the moon — which are used to predict the presence of water — might be a false positive and not exist at the levels predicted. Instead, what scientists thought was hydrogen in water molecules might be calcium as part of a mineral called apatite. If so, this would mean that the Moon has a lot less water than hoped. This data might also explain the lack of water seen in the Apollo samples as compared to what is suggested should be there from more recent orbital data. This also might explain the conflicting results from instruments on Lunar Reconnaissance Orbiter. Want to explore the Moon’s north pole? You now can, from your home, using an interactive mosaic of images taken by Lunar Reconnaissance Orbiter. One NASA lunar orbiter snags an image of another NASA lunar orbiter. NASA’s Lunar Reconnaissance Orbiter has spotted China’s Yutu rover on the Moon’s surface. 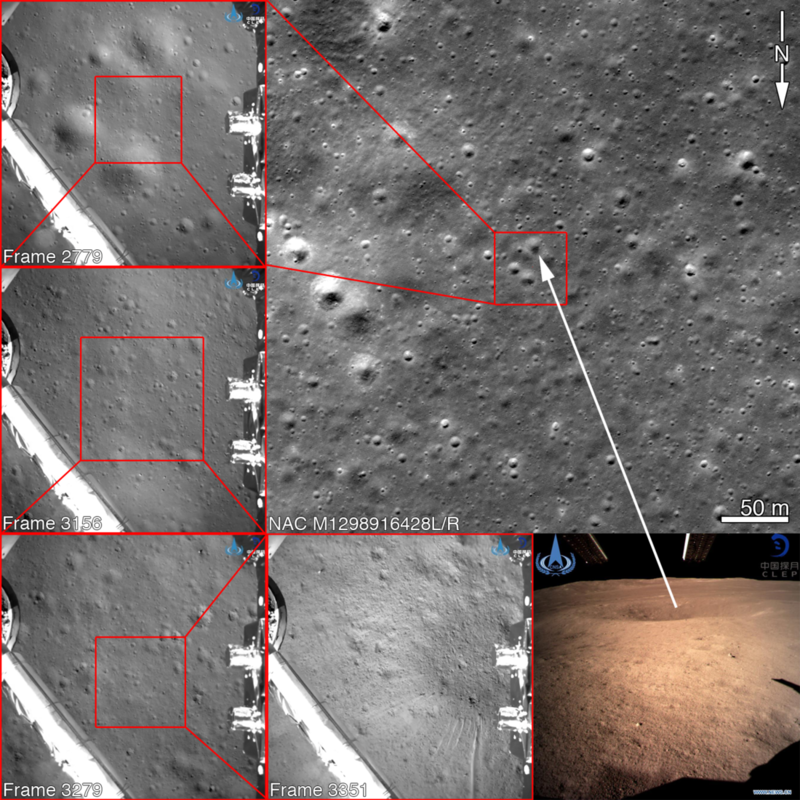 These images confirm that the rover landed in Mare Imbrium, not Sinus Iridum, the originally announced landing site and the site that many Chinese news sources continue to report as the landing site.